Another line has been etched into the stone of America's greatness. Upon President Obama's face is a picture of the responsibility and burden of the presidency. As I look at this picture, I am inspired by the strength and optimism of the United States of America. President Obama delivered a powerful message to our nation as he summoned the citizens of America to act in good faith while also delivering a message to the world that we will continue to defend our values, freedoms, and way of life. Great speech and great message. Government is here to help those who are in need but, government is not the answer, we as a people are the solution to America's problems. If we dream it, if we act upon it, if we live it...yes we can accomplish it. I pray for our new president and his family. God bless America. Read Nic's earlier blog posts here. Editor’s note: Nic Lott is Director of Special Operations in the Mississippi Governor’s Office of Renewal and Recovery. He was the first African American student body president at Ole Miss. The "Gilded Cage," Good luck with that and doubt seriously Obama's going there. The "buzz words" I heard today were from benediction. I don't know if they're old words or new. The phrase was something on the order of, "We must turn to each other rather than on one another." I agree that you could see the depth of his fellings on his face. He is strong and will bring this country to the one of yesteryear. I proudly stand today as a white American and join hands with all colors and creeds to make this country untied as one people ,where anything is possible. Let all reach for the highest star. I don't know, but i would like to know what is going through God's thoughts right now. I am still having trouble with the whole HUSSEIN, name thing, I am not sure I can follow that.... But time will tell. I am a democrate and a avid supporter of Barack. I do realize that this is a centinal event for black americans. But, in light of MLK... I have a dream... That one day we will not look upon the person taking office as black, white, yellow, brown... but, American. 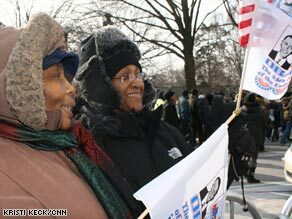 This inauguration has been so heavily covered as "victory for the black americans". When we segregate ourselves, for one reason or another, we alienate a great many other people. I look at this as a great man (the best man) for the most important job of our time. Let's make this a victory for everyone! I hope the next mark will be when we have a woman serve as President. I can't wait for that day! and offically President of this U.S.
now I believe, born in 1939, to think this special event. Obama is willing to lead, are WE willing to follow?